You now have a reason to fear Easter as THE BEASTER BUNNY is here. A 50 foot man-eating Easter bunny is on the loose in a rural town in America leaving half devoured corpses of buxom women in its path. The greedy cash obsessed hippy mayor believes it to be some kind of uprising from the calm polite Amish community, fed up of being pushed around they have set their eyes on a terrorist attack on the town. This is of course a completely bonkers idea by the mayor who is so high on grass its surprising he can even stand up. The towns hope of survival lies in the hands of a deranged dog-catcher and a wannabe actress. 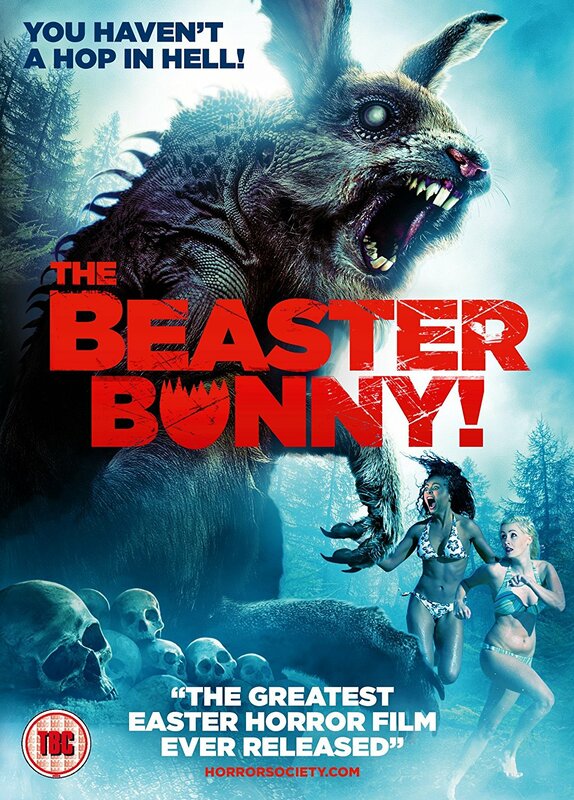 Written/directed by the Snygg Brothers who both have several years of film credits to their names, THE BEASTER BUNNY is a comedy horror which plants its tongue firmly in cheek. The killer bunny itself is a puppet which has been superimposed to give it the frightening height of monstrosity it deserves. It doesn't look too healthy but when you are chowing down on silicon implanted women and obese men you are bound to have problems. Here are some of the people that end up being victims of the bunny, you may recognise them if you are a fan of low budget films: the exotic beauty A.J. Khan (SHOCK-O-RAMA) and the voluptuous Darian Caine (SPIDERBABE). Outside of the bunny, the rest of the special effects are sadly cgi, which works as it is really bad cgi but it would have worked better with the kind of effects seen in early Herschell Gordon Lewis movies as well. The cast are clearly having fun with the film which shows in their performances throughout so its hard to point out a stand out performer. Fans of B-movie films will get a real kick out of this film, which is obviously the whole point of this mental horror comedy.